Northern Sri Lanka – Georgina and Co.
‘I’m just going to offer him a beer,’ our guide, Sidantha gestures towards the young soldier staring blearily out to sea, ‘he looks miserable.’ The soldier is sitting on his own beside a sentry box made of palm leaf and mud, his chin propped up on an enormous gun. He accepts the beer with a wide grin. We found him earlier on a deserted stretch of beach. If we peer down the beach we can just make out the next sentry box, another young, bored boy staring out to sea. In either direction, the sea pounds the shore, rough against the white sand. Sea eagles fly over our heads and little crabs scuttle underfoot. The local fisherboys who arrived earlier carrying a plastic bucket full of tiny shellfish can’t stop staring at my son, Arthur and I, startling away if the football we are playing with comes too close. We are on Mannar Island off northwest Sri Lanka. 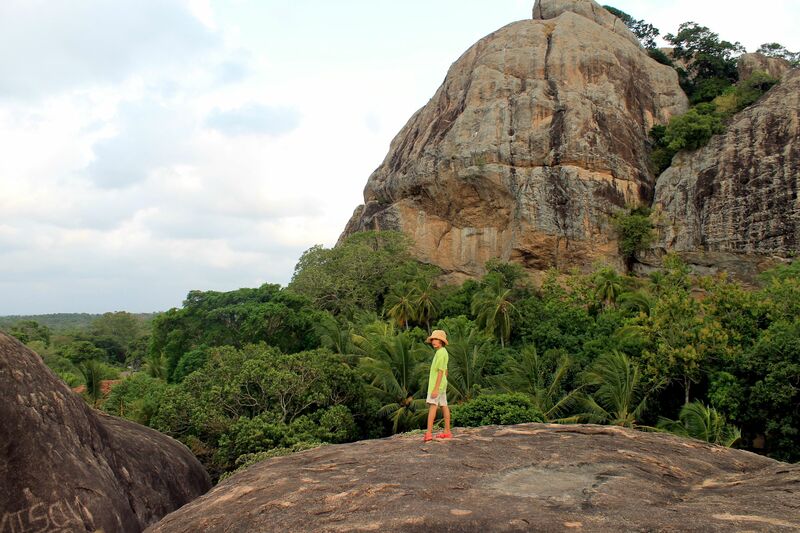 This island was, until very recently, cut off from the rest of Sri Lanka and it still feels very remote. The LTTE’s (Liberation Tigers of Tamil Eelam) struggle for independence effectively came to an end in May 2009, after almost thirty years of fighting, but Mannar Island in common with the rest of northern Tamil Sri Lanka, is still struggling with the after effects of decades of deprivation and suffering. Much of the population was caught up in the fighting and many others ran away. The train bridge connecting Mannar Island to mainland Sri Lanka was blown up at the start of the war and the road bridge was often attacked. Successive waves of Tiger and government forces occupied and fought over Mannar and it was the scene for a series of atrocities. The island itself is a beautiful, 50km square, sand spit stretching out towards the Indian sub-continent and ending in the famed island shoal of Adams Bridge. 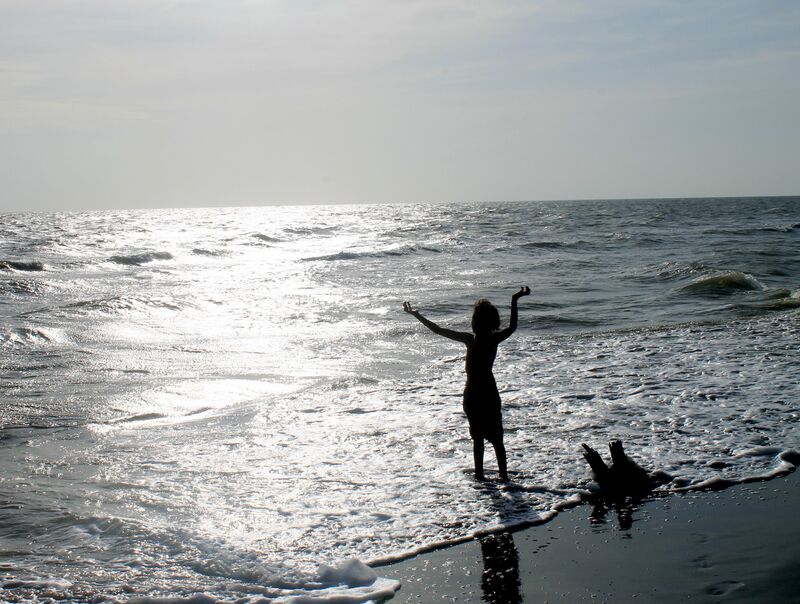 The sea around Mannar forms part of the Gulf of Mannar Biosphere Reserve and there are healthy numbers of endangered dolphin and turtle species as well as sharks and even Dugong. Before the war Mannar was a flourishing place with a ferry link to India and a train link to Colombo and Jaffna. Oil had been found in the northern most tip and Indian oil companies had begun to buy up land. 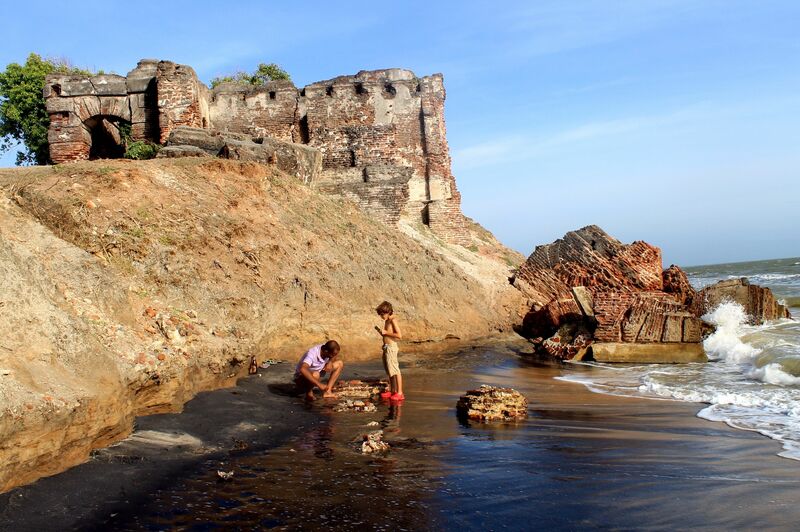 It had one of the largest salt plants in the Indian Ocean and the remnants of the famous Ceylon Pearl fishery. Fishing was big business and fish were plentiful; bird watchers came in their thousands to view the wading birds of Giant’s Tank and pilgrims came to visit the famous statue of Our Lady of Madhu. 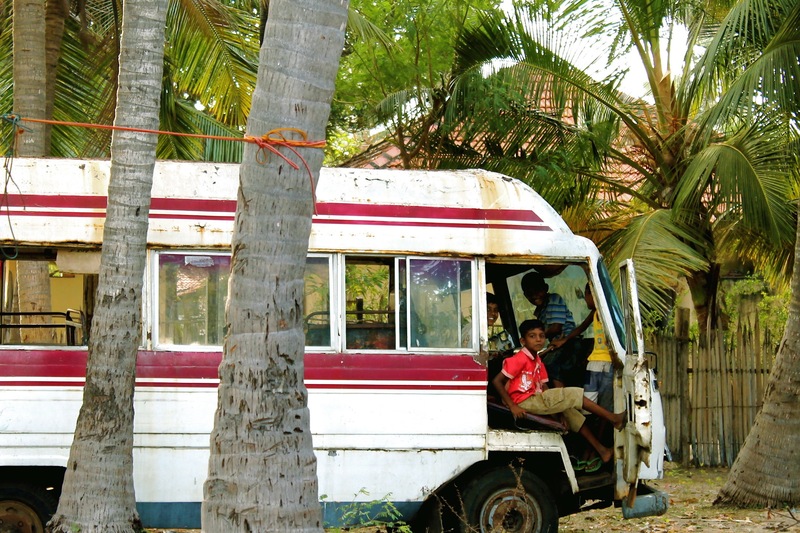 The struggle for Tamil independence though ended all this and although Mannar Island has been earmarked by developers eager to replicate the success of their beach resorts further south, it remains, two years after the war ended, a place cut off from time. ‘It is like the rest of Sri Lanka fifty years ago,’ Sidantha tells me, ‘during the war, people survived through fishing, they were resilient, living on an island meant that they could look after each other. The ones who managed to avoid the war kept their heads down. They are tough island people’. In contrast to the buoyant character of Mannar, the mainland this far north seems desolate and deserted. Driving up to Mannar along the road from the ancient city of Anuradhapura, the land is empty. There are few other vehicles; we see only the shells of deserted palm leaf shacks, the bare bones of farms and the abandoned shells of industry. Sidantha drives us cautiously past notorious Manic Farm, a government internment camp. It is rumoured that hundreds of thousands of people were interrogated here. It is still in use, but now houses displaced people. Sidantha tells me not to take photographs as we drive past a long line of corrugated shacks and sheds. The army is here in large numbers and the road is fenced on either side with razor wire. Although there has been peace since the final bloody siege, which killed the LTTE leader, Vellupillai Prabhakaran and an estimated 100,000 civilians, there are still thousands of displaced refugees kept in camps like Manic, seemingly invisible to the country’s media. 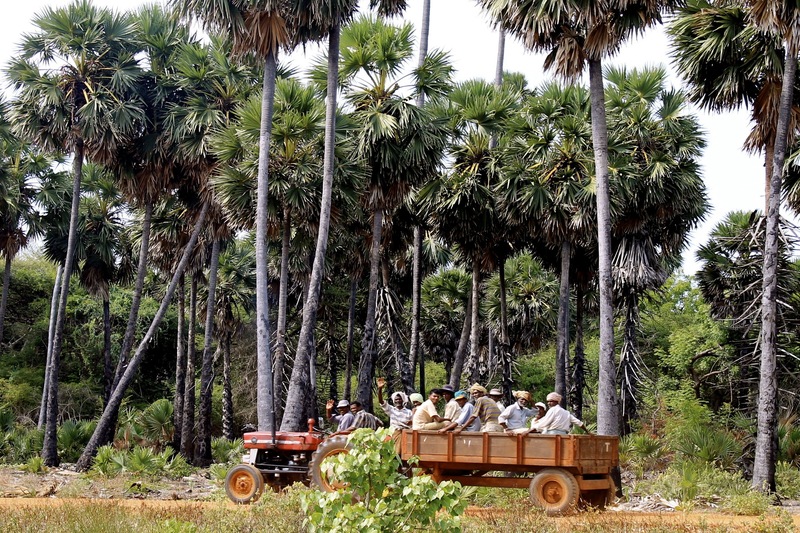 Large areas of Tamil land stretching up north and east from Mannar are mined and the UN has estimated that it will take up to forty years to completely clear Sri Lanka of mines. Until their homes are made safe, people have nowhere else to go. There are numerous army checkpoints on the road past Manic, but they are friendly and wave us on. We have been through many checkpoints already. Off the coast of Kalpitiya, only an hour or so north of Colombo, we were turned back from our dolphin ride by the navy, who presumed I was from an NGO. When I asked what the problem was, there were mumbled comments about smugglers and sea mines. Although tourism is developing here, it has to coexist with the jitteriness of the armed forces. The peace is still new and fragile. Although guidebooks do not yet cover much of northern Sri Lanka, companies such as Experience Sri Lanka have begun to offer tours. Much of the focus is on wildlife viewing. 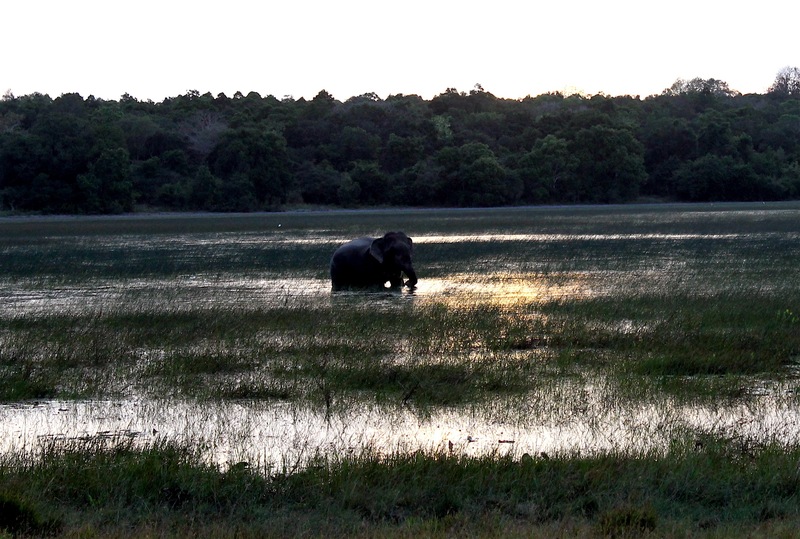 Wilpattu National Park, 30 kms north of Kalpitiya reopened to visitors in March, 2011. During the war, the Tigers entered the park and killed a number of game wardens; they burnt down game huts and laid down mines. Most of the animals disappeared, but are back now in great numbers. We went on a three-day camping safari here and saw leopards, sloth bears, elephants and crocodiles as well as an enormous number of lizards, birds and deer. We also encountered the army sheltering behind an entrance made of elephant skulls. They allowed us on to the deserted beach, close to Horse Point where the legendary founder of the Sinhalese, Prince Vijaya first landed, but we were not allowed to swim. The beaches here have amazing copper sand which our guide told us was very valuable, but due to the war hasn’t been exploited. Deep in the jungle, we were taken to an unexcavated temple. 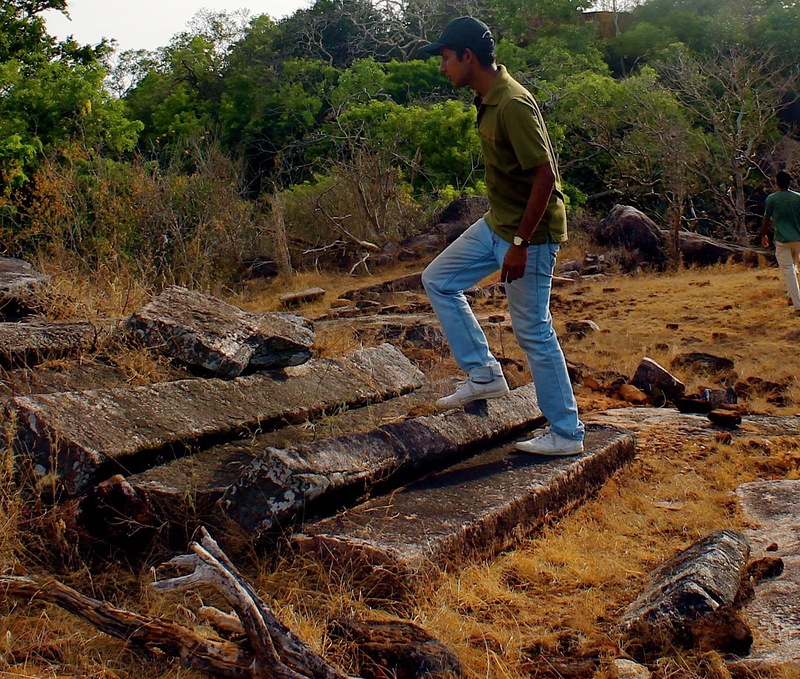 It was an astonishing sight, fallen pillars carved in ancient Singhalese covered in the dung of sloth bears and left to the elements. Now the war is ended, I was assured, archaeologists would investigate, but for now it’s deserted. We saw only two other cars during our stay; it felt like a fragile moment in time before the tourist industry descended. The road past Manic Farm becomes bleaker still as we turn towards the coast north of Silavattru. This coast around Kondaichchi Bay was once the setting for some of the most celebrated pearl fisheries in the world. They are of great antiquity, known to the Phoenicians as Taprobane. They were prized by the Romans, traded by Arab sailors and mentioned in the Thousand and One Nights. By the early 20th Century however, due to over fishing and the advent of the cultured pearl, the industry went into decline and the war ended what little fishing was still carried out. There is no sign now that this coastline was once the hub of a worldwide industry, save the ruins of a large red brick mansion slowly slipping into the sea. This was once the house of the first English Governor of Ceylon, Frederick North who oversaw the pearl fishing from here in the early 19th century. The cliffs appear to be made entirely of old oyster shells, layer upon layer of them. Just up the road we discover another poignant remainder from British Colonial rule; the last headquarters of the Orient Bank Corporation, all that’s left are a few walls and a pitiful gravestone commemorating the death of a British soldier to sunstroke. We drive the last hundred kilometres to Mannar Island itself. As the sun sets, lilac and yellow over the salt flats, we stop to look. There are no buildings out here, just wild ponies and birds and the flats are magnificent. We cross an enormous new bridge, a tangible sign of investment in Mannar. From here you can see the shattered remains of the old railway bridge and in the distance a number of new Mobil telecom towers. Night falls quickly in the tropics and by the time we reach Mannar Town, the largest settlement on the island, it is pitch black. 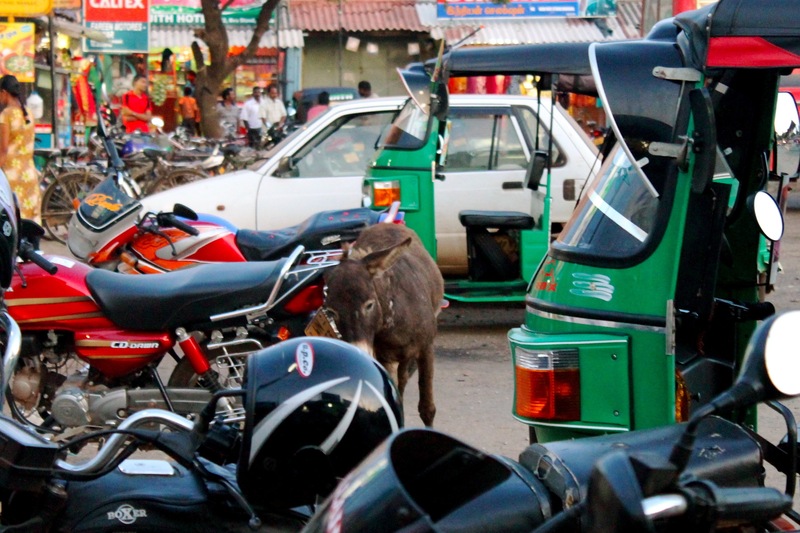 There are not many streetlights and we drive slowly through wandering cows and wild donkeys. The donkeys are unique to Mannar the descendents of animals brought here from Somalia as draft animals. They appear healthy and well fed; baby donkeys, fuzzy ears swivelling watch us from the roadside. We stop at Mannar Town for provisions. Mannar town is unpretentious and noisy and an assault on the senses after so many days in the empty countryside. The main industry here is fish processing and the smell of fish fills the air. Cars and brightly painted lorries honk noisily at each other in some secret road language as Sidantha negotiates the pot-riddled road up to the small town of Peselli where we are staying. 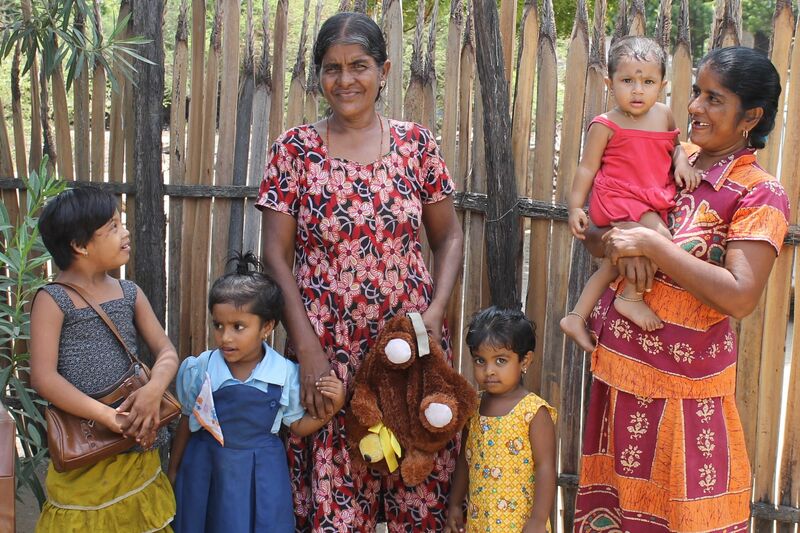 There are no hotels or hostels on Mannar, Sidantha runs a home stay tour here, the only one of its kind. The owner of the house is a widow. She and her children have only recently returned from Tamil Nadu, where they fled during the troubles. They have family all about and we find ourselves immersed quickly in village life. The small children from next door rush in to assess us. Their uncle, Rohan comes too. Rohan tried to escape to Australia during the war. He ended up in the Christmas Islands, ‘I wish I was still there’ he tells me, ‘it was the best time of my life’. It’s only later that I realise that he was in an Australian deportation camp. Rohan is ambitious, but his dreams are still of escape. He is planning to move to Italy. ‘Mannar has been a cage all my life’, he says. 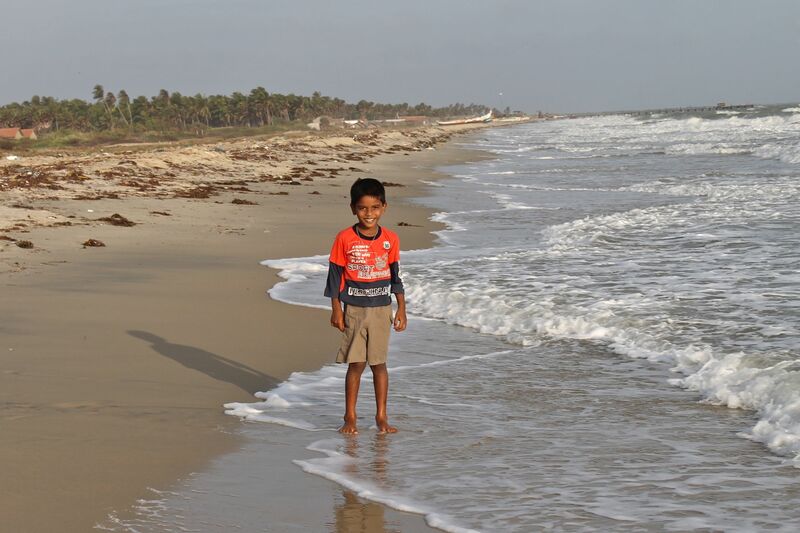 Even though there is peace, he still finds it difficult to associate Mannar with progress and possibility. We spend the next few days exploring Mannar. It is a beautiful forgotten place. The roads are lined with coconut trees and the occasional baobab, brought over from Africa by Arab traders to feed their camels with. Government investment seems to have ended with the new bridge, the roads are terrible, donkeys and cows negotiate them with more success than cars and electricity is intermittent. People are amazed to see us; small children stare at us with shock and excitement. Older men try out their English and cross the street to touch Arthur’s head in a blessing, faces split in huge smiles. The people are infectious and impressive. Even the soldiers smile and wave. ‘They are on a campaign for hearts and minds’, Rohan tells us, ‘they give out t-shirts and toys in town’. The army camps are made of palm branches and mud, there are occasional barbed wire fences but on the whole they don’t look very threatening. It is hard to imagine these young boys being involved in such a brutal war. Sidantha and Rohan take us to Madhu cathedral. Mannar is predominantly Catholic and although people retain many of the customs of their Hindu ancestors, the bindis and saris and festivals, this area, colonised by the Portuguese is solidly Christian. The church was a cohesive force during the war and the Bishop of Mannar is a force for change here. The churches have been recently repainted and we see many new ones being built. The cathedral is on the mainland and we are stopped by the army before being allowed up into the jungle to visit it. There is an enormous swathe of jungle here like a great belt reaching up to below Jaffna. It was extensively mined by both sides during the war. It is not known what animals survive; but few are seen. The cathedral is built in tropical Portuguese style with a series of stained glass windows and coconut shell lamps. Up to a million pilgrims from all over Sri Lanka came here on August 15th for the festival of the Assumption of the Virgin Mary, camping in the grounds amongst the monkeys and banyan trees; a visible sign that times have changed for the better. Round the back of the cathedral however, is a shattered roof, its blackened spars still visible. This is where the army fired mortar shells, killing 160 people sheltering from the fighting in one of the most notorious actions of the civil war. Rohan remembers when it happened. There is a shell-shocked atmosphere to the quiet contemplation of the worshipers. Rohan was a lorry driver before his ill-fated Australian adventure, taking fish to the mainland. He takes us to the loading depot to find fish for tea and to a deserted beach up from Pesali. 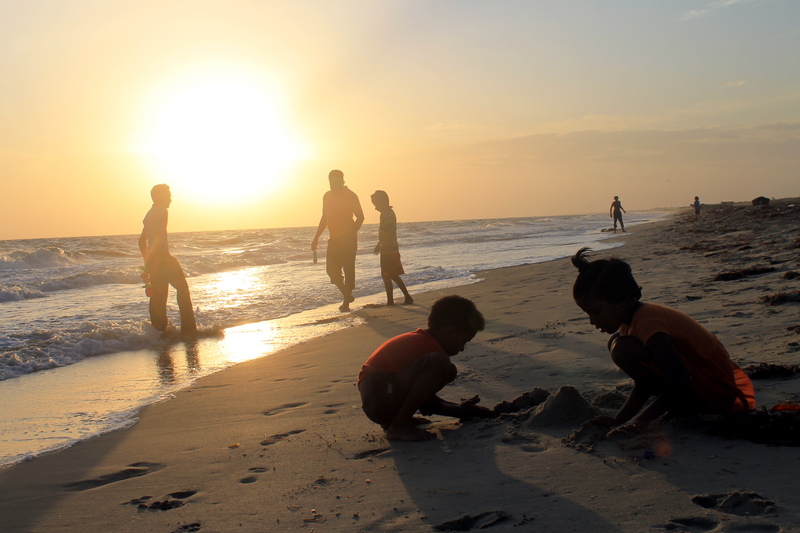 The beach runs for miles along the Bay of Bengal on the East coast. Its pale waters hide huge quantities of fish and turtles. Rohan assures me that nobody catches turtles anymore; the fine is too big he says. We watch local fishermen using traditional off-shore nets. 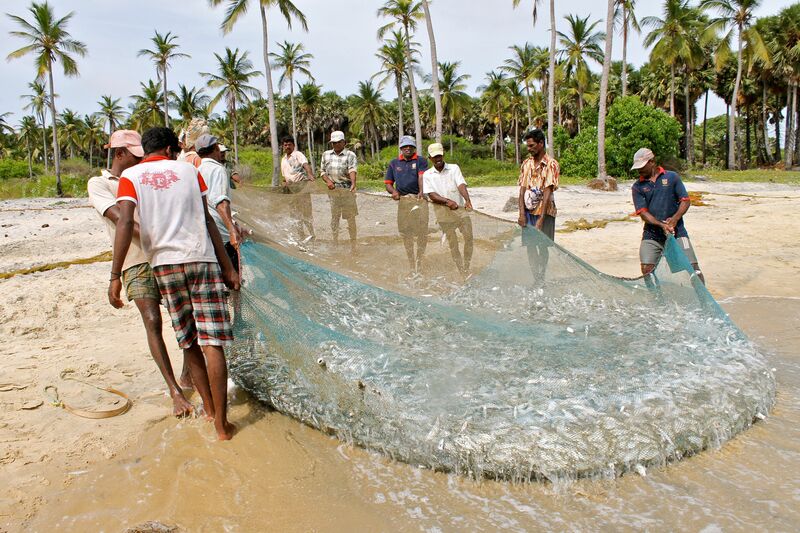 They stride a few metres out to sea and then drag the nets in, an astonishing number of fish fill the nets, a great silvery mass on the beach. The fishermen stand around pleased with the quantity, as the fish gasp and leap. Small jellyfish and octopus slither through the nets and to everyone’s amusement I replace them in the sea. It’s a beautiful picture, the coconut trees and endless turquoise sea. It all seems idyllic but Mannar has a dark history and sharks are gathering to determine the future. Rohan tells me of property developers from Colombo anxious to buy up beach land and of oil speculators from India. People are returning home from abroad, to find their houses taken and their land occupied. Land disputes are commonplace. A British ex-pat I meet later tells me of possible plans for the north and for Mannar. If a disputed Indian sea crossing through Adam’s Bridge goes ahead, then Mannar Island will become an important seaport. The Chinese have built an enormous coal-powered station further down the coast on Kalpitiya and there is talk of building another on Mannar. ‘North Sri Lanka is opening up’, my British friend tells me, ‘it’s becoming cowboy country’. Mannar is set to change; but for now it’s a privilege to have been somewhere with so much beauty, character and charm at a pivotal point in its history. Our trip to the north ends in a splendid, long drive across empty, arid country to the east coast and the bright lights of Nilavelli hotel. We arrive at the same time as a government minister and have to wait in line behind various army dignitaries. 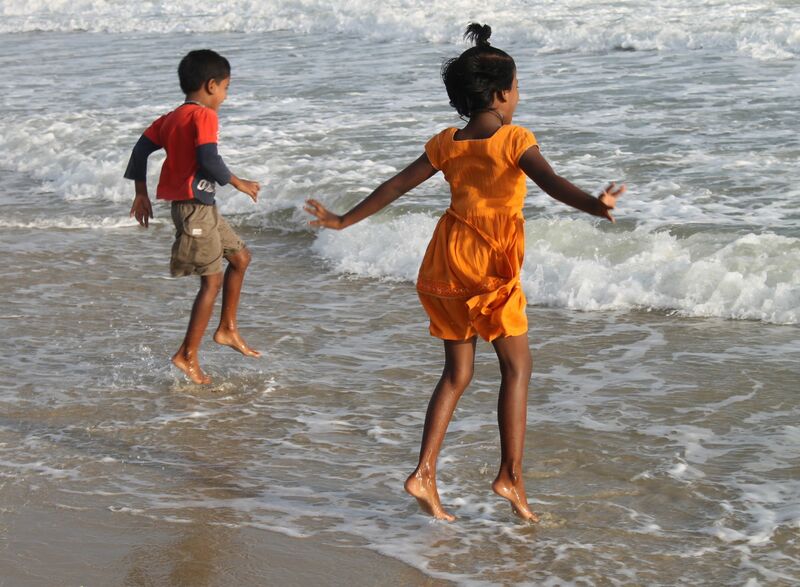 The simple charm of Mannar suddenly seems all the more appealing. Pingback: Family adventure in Sri Lanka for TaketheFamily | Georgina and Co.
Pingback: Quirky and Family-friendly Places to Stay Around the World (for www.takethefamily.com) | Georgina and Co. Thanks for the great article! I’m looking forward to make this trip soon and i’m collecting impressions! Cheers!